"Fishes of the Middle West" (PDF). United States Government Printing Office. 1943. "Fish and Shellfish of the Middle Atlantic Coast" (PDF). United States Government Printing Office. 1945. "Chincoteague: A National Wildlife Refuge" (PDF). United States Government Printing Office. 1947. "Mattamuskeet: A National Wildlife Refuge" (PDF). United States Government Printing Office. 1947. "Parker River: A National Wildlife Refuge" (PDF). United States Government Printing Office. 1947. ↑ "University of New England — Maine Women Writers Collection — Research — Featured Writers — Rachel L. Carson Collection, 1946–1964". Une.edu. Retrieved 2014-08-04. Carson, Rachel (1962). Silent Spring. Houghton Mifflin. Brooks, Paul (1972). The House of Life: Rachel Carson at Work. Houghton Mifflin. ISBN 0-395-13517-6. This book is a personal memoir by Carson's Houghton Mifflin editor and close friend Paul Brooks. 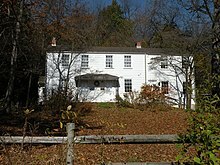 Brooks' papers are housed at the Thoreau Institute at Walden Woods Library. Gottlieb, Robert (2005). Forcing the Spring: The Transformation of the American Environmental Movement. Washington D.C.: Island Press. ISBN 978-1559638326. Lepore, Jill, "The Shore Bird: Rachel Carson and the rising of the seas", The New Yorker, 26 March 2018, pp. 64–66, 68–72. Sideris, Lisa H. (Fall–Winter 2009). "Fact and Fiction, Fear and Wonder: The Legacy of Rachel Carson". Soundings. 91 (3–4): 335–69. JSTOR 41179228. Souder, William (2012). On a Farther Shore: The Life and Legacy of Rachel Carson. New York, NY: Crown Publishers. ISBN 978-0-307-46220-6. Rachel Carson Papers. Yale Collection of American Literature, Beinecke Rare Book and Manuscript Library, Yale University. Koehn, Nancy, "From Calm Leadership, Lasting Change", The New York Times, October 27, 2012. "Why Our Winters Are Getting Warmer", November 1951, Popular Science — early article by Rachel Carson about how the ocean's currents affect climate (excerpt from her 1951 book, The Sea Around Us). Michals, Debra. "Rachel Carson". National Women's History Museum. 2015.